This tour leaves from CANCUN. If you are staying on Isla Mujeres, click here. Whale Sharks are not whales. They are sharks, but these giant sharks don't even have teeth! They filter planton as they skim the surface of the ocean with their mouths wide open. This gives us as humans a unique opportunity to get up close to the largest shark on earth. 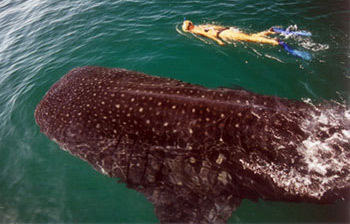 Snorkel beside the amazing whale sharks for an unforgettable experience. GUARANTEE: You WILL SEE Whale Sharks or you will receive a 75% refund! It is also very common to also see sting rays, angel rays and sea turtles. The tour only takes 10 swimmers out each tour. It is 45-60 minute boat ride to where the Whale Sharks are located. If you want to go on the boat, but not snorkel, it is the same price per person. DISCLAIMER: Snorkeling is not for everyone. You should not snorkel if you have any of the following: Heart condition, pace maker, asthma, poor circulation or high blood pressure. You CAN snorkel, but at your own risk. About Whale Sharks: The whale shark is the biggest shark and the biggest fish. It is NOT a whale. It has a huge mouth which can be up to 4 feet wide. This enormous shark is a filter feeder and sieves enormous amounts of plankton, krill, small fish, and squid to eat through its gills as it swims. The shark can process over 1500 gallons (6000 liters) of water each hour. Whale sharks are slow swimmers, going no more than 3 mph (5 kph). Whale sharks are harmless to people and usually indifferent to divers. This shark swims slowly near the surface, consuming small crustacean plankton and small fishes. Plankton is it's main source of food.